At nearly every house I’ve lived in, I’ve either planted a pomegranate tree, or there was one already there. The Robot Ranch is no exception. There is a very prolific tree out front. Apparently, the prior owners didn’t have much use for pomegranates, as there were many random visitors who stopped by to politely ask if they could have some. With the rest, I ate some, made some delicious juice, and jellied the rest. It always looks like a murder scene when I’m done. Amazing how juicy and stain-y they are. 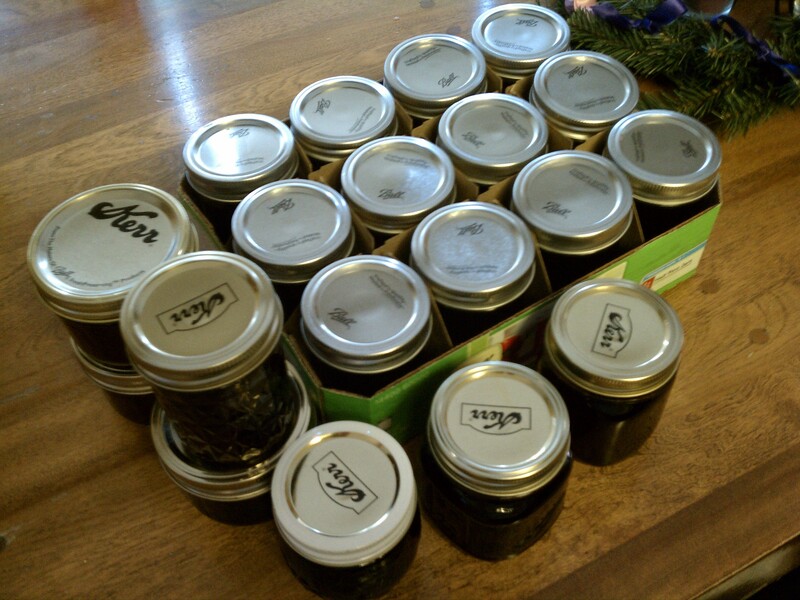 Pretty simple, but it takes a little while to gather things up, juice the fruit, sterilize the jars, boil the juice, pectin and sugar, jar and process (boil the filled jars). Oh, so yummy. Measure 5 cups of sugar into a separate bowl – set aside. Measure 3.5 cups of strained juice into a 6-8 qt. saucepot. 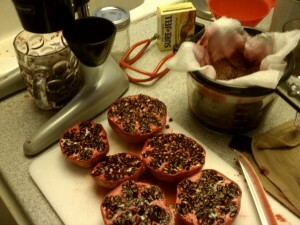 Add 1 package pectin to juice, mixing thoroughly. Bring juice to a full rolling boil, stirring constantly to prevent scorching (reduce heat after boil if necessary). Stir in sugar, mixing well. Return to a full rolling boil stirring constantly. Remove from heat. Skim off any foam. 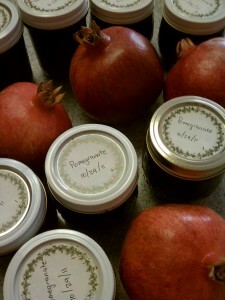 Fill hot jars quickly to 1/8″ of top. Wipe off rim. Cover quickly with warmed lids and screw bands tightly. Return jars to boiling water bath and boil for 10 minutes. Makes 6 – 8oz jars. This entry was posted in Fruit, Make, Ranch. Bookmark the permalink.